Fabulous photograph of the Bridgeton Purple & Crown Flute Band taken in Belfast in 1935. Oct.2007, Laurie Singleton, extract from email. 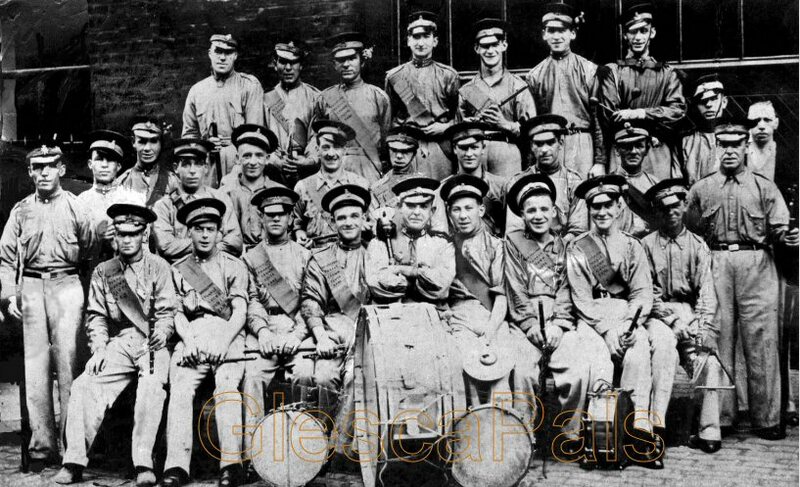 Billy Fullerton the leader of the flute band & of the Brigton Billy Boys gang is seated front row no.5. Tam Bain told me the Bridgeton Purple & Crown Flute Band had a large following. The band would march with up to 60 strong members with eight 'spearmen' marching either side of the band with their followers thronging the pavements. The Spearmen got their name because they actually carried 'spears' often seen being sharpened prior to a march. Nowadays wooden batons are carried to keep the band in marching formation and the followers from spilling into the ranks. This band was a 'ragtime band' a '12th July band', not a derogatory remark but a term often used to describe a band of gallus first flute players as opposed to concert flute players. Invariably these type of bands had the most followers, as it is today. The modern day flute band equivalent would be the 'Bridgeton No Surrender' Flute band... The Noey! The Bridgeton Purple & Crown flute band marched from the Orange Hall in Kerr Street Bridgeton. This 3 storey building (now demolished) must have been a busy place in those days. and top floor was the Orange Hall. "....... the flute band photograph was taken in Belfast in 1935 and that the young man in the top row holding the flute, Robert Burnside, was shot in the stomach in Belfast that year by a rooftop marksman!" Tam went on to explain such was the unrest and tension about, that for a week there was no way on or off the island. In 1935 Tam, then 17yrs old, was playing the cymbals, all new members whilst learning the flute started by playing the cymbals, progressing to the flute when enough tunes had been learned! 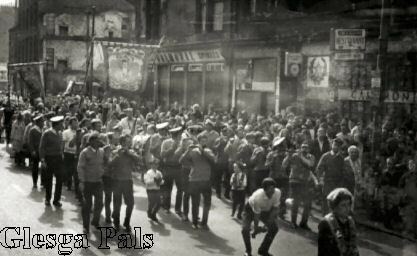 Tam told me he was pals with both crowds, mostly the Derry Boys, but wandered between the two gangs, as did many others. Billy Fullerton of the Brigton Billy Boys. dragged their rain through the cemetery trees. the branches swung, heavy, across the lamps. a name and an urn, a date, a dove picked out, lost, half regained. a quiet man at last, dying alone in Bridgeton in a box bed. Go from the grave. The shrill flutes are silent, the march dispersed. Deplore what is to be deplored, and then find out the rest. Dec.2003 extract from messageboard, Peter Scott, Vancouver, Canada. ".......Hi wull, I'm almost sure the guy immediately to the left of the centre guy ( Billy Fullerton ) with the big drum (his left) is Tommy Bain from Fairbairn Street Who would now be about 84 years old." "........Tam Bain who is in the photo (Big Billy Fullertonton's Band ) is alive & kicking he uses the Keystane on a Friday and Saturday along with his brother Andy.........It's normally the afternoons he's there......... no. 6 front row is Tam Bain. no 9 front row is Wullie Wilson with the triangle, the guy standing next to him holding the mace is his dad (that's who the Wilson memorial is named after) .........No 5 in the centre row is Sammy (Kelly) Campbell)........ Cheers Big Raymond". Great alarm is stated to have been caused in the heart of Belfast on Monday night, when a band from Bridgeton ( described in certain quarters as the 'Billy Boys' band ) which had been over in Ireland for the 'Twelfth' celebrations marched into Royal Avenue to catch the night boat to Glasgow. Accompanied by a big crowd of followers , the band played a party chorus , while its supporters , men and women , sang and danced behind. Suddenly a young man on the pavement brandished a revolver. The crowd scattered and fled in all directions. The man with the revolver was surrounded by a hostile mob , and took refuge in a billiards saloon. The crowd were on the point of attacking the premises when tenders of armed police dashed up , and the fugitive was taken away in one of the tenders, while a strong force of police remained behind till the crowd had dispersed. Almost simultaneously another shot was fired and another detachment of police dashed in this direction with rifles at the 'ready'. In the twinkling of an eye the street was deserted. The gang was named after King Billy not their leader so when we sing it we sing about them as a group of people... remember they were not the first sectarian gang in Glasgow though you wouldn't think so according to the press. The Evening Times. Wednesday 25th July 1962. About 1,000 people packed Brook Street, Bridgeton , Glasgow, today , outside a drab tenement, to pay their last respects to Bridgeton's uncrowned king - 57 year old Billy Fullerton, King of the Bridgeton Billy Boys, who died at the weekend. 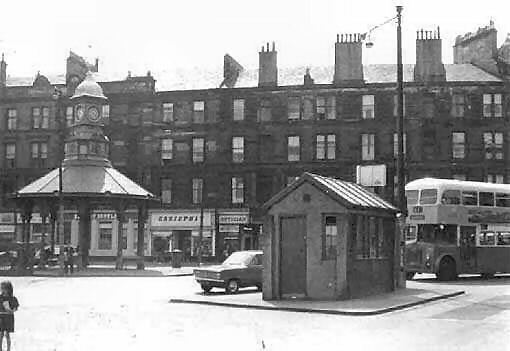 His funeral to Riddrie Park Cemetery today stopped the traffic at Bridgeton Cross, scene of his gang's most bitter battles in the 1930's. A strong force of uniformed Police kept the crowds under control outside No.8 Brook Street. As the simple oak coffin was carried from the close a flute band, made up of members from various Bridgeton bands, played "Come To The Saviour". Two red, white and blue wreaths were placed on top of the coffin and a car was packed with flowers. As the cortege moved slowly into Crownpoint Road it was led by the band to the strains of "Onward Christian Soldiers". Billy Fullerton was being taken on his last journey through the streets of the Bridgeton he loved, and at Fielden Street the band joined a bus to continue their journey to Riddrie Park Cemetery. Since his "abdication" after the arrival of Sir Percy Sillitoe as Chief Constable of Glasgow, Billy Fullerton had left a non-violent life. Many people waited at the cemetery for the funeral cortege to arrive. Tam Bain and Wullie 'swagger' Watson.